Pearl Harbor bombed 1941 At 7:55 a.m. Hawaii time, a Japanese dive bomber bearing the red symbol of the Rising Sun of Japan on its wings appears out of the clouds above the island of Oahu. 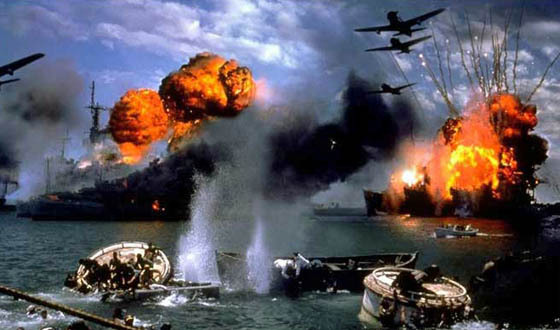 A swarm of 360 Japanese warplanes followed, descending on the U.S. naval base at Pearl Harbor in a ferocious assault. The surprise attack struck a critical blow against the U.S. Pacific fleet and drew the United States irrevocably into World War II.